Baldur’s Gate: Dark Alliance finds its basis in the shadow of table-top games such as Dungeons & Dragons: no set storyline for the character as the story commences, no evil empire to overthrow, no world-dictator-to-be to annihilate, no relative’s death in need of an avenging. You are simply a generic adventurer (either a human archer, a dwarven fighter, or an elfin sorceress) in search of a quest. A dungeon master of sorts narrates the scene as you enter the town of Baldur’s Gate, a legendary location stocked with citizens who will not so much as stop and say hello to your character (odd in an RPG, where typically every single being which possess the ability of speech has the time to toss their two cents into your fountain of an adventure). Immediately upon entering the town, you are beaten viciously by thuggish hooligans who strip you of your possessions. You enter the local tavern, where the patrons inform you that your attackers belong to one of the two conflicting thieves guilds in Baldur’s Gate, and that attempting to reclaim your possessions would be fatal. You, being the spunky, never-say-never adventurer that you are, refuse to heed the given advice, and begin to plot your revenge; thus, your quest is found, and your story begins. Dark Alliance is divided into three parts, aptly named “I,” “II,” and “III.” Each part takes you to a different locale, in which quite a few objectives await your completion. These objectives can be as simple as retrieving a brewski for the town drunk, or as arduous as defeating a nefarious giant eyeball. To help you along your journeys are numerous save points; you honestly cannot go more than two dungeon rooms without stumbling across one. 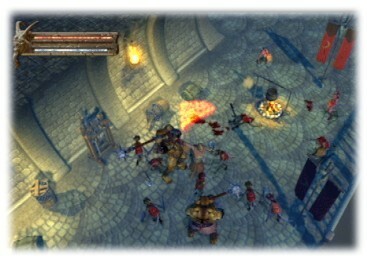 Not only can you save your progress at these save points, but if you are involved in a two-player affair, and one of you is rendered deceased, the save point becomes a point of resurrection, returning life to your fallen comrade when the player still living invades his/her personal space. This is quite helpful, for in the event that you die, you need not retrace many steps, and you need not travel so far with one player among the dead, but why this was put in place instead of a save/resurrect button on the character menu is beyond this member of the GameCola staff. The gameplay of Dark Alliance is much like that of Diablo II or Gauntlet: Dark Legacy—hack and slash that opponent, move on to this next room; repeat for several hours. This style of gaming can be enjoyable to some; the game is quite simple in that aspect, and thus appeals to gamers troubled by the complexity of many of today’s games. Others may find it tedious, however, for you are constantly doing the same thing over, and over, and over, and over still. Especially when you have to defeat monster after monster to gain enough experience for that next level, or to gain enough gold for that new weapon—the game can become quite monotonous. But, monotonous in a fun way. Graphics-wise, the game is a work of art. I gaped in awe at the water effects for minutes on end, and would oft prance about in puddles, just to see the beautifully realistic trail left behind me. The characters, and other parts of the scenery, are nicely detailed as well, with the especially enjoyable feature of your character’s appearance changing as you add and subtract equipment from your body. It gives the game a more personal feel to it, to see your character doing battle wearing the armor you purchased for him, instead of appearing to wear the same generic leather armour that many games contrive. The cutscenes especially are beautifully rendered, looking not unlike an actual movie. Baldur’s Gate: Dark Alliance is the type of game that, while an option for two players exists, is probably best to take the solo route. The money and items to be taken from the bodies of fallen enemies are given to whomever reaches them first, which becomes quite a hassle if you are the type of character who attacks from a distance (i.e. : archer), for the player closest to the corpse always retrieves the loot. A shared gold feature would have been nice here, where the gold would be divided between the two party members, but alas, such a system fails to exist. So while you are standing back, doing a lot of the attacking, saving the other character from death, the other character can go and gain all of the bounty. Also, the game can become quite irritating if the player not you is slow, and you need always to wait for their character to catch up to yours. As a single-player game, though, it is a nifty little adventure game that can be completed without much difficulty in under six hours. Recommended by GameCola as a rental at best, because after the game is completed, there is little else to do, unless you are the type who likes to go and max out every single stat about every single character, and gain every single item and every single spell. Then the game might be able to last you a week or two, if you play it sporadically. But for the rest of us, a secret character to gain is all of the replay value this game has to offer. For what it is, Baldur’s Gate: Dark Alliance is worthy of a rental: it has an interesting plot, gorgeous graphics, and can be completed in a decent amount of time. But not enough exists to make it worthy of a purchase. River City Ransom: Undergound - FUNDED! It finally happened! Our dreams have come true!